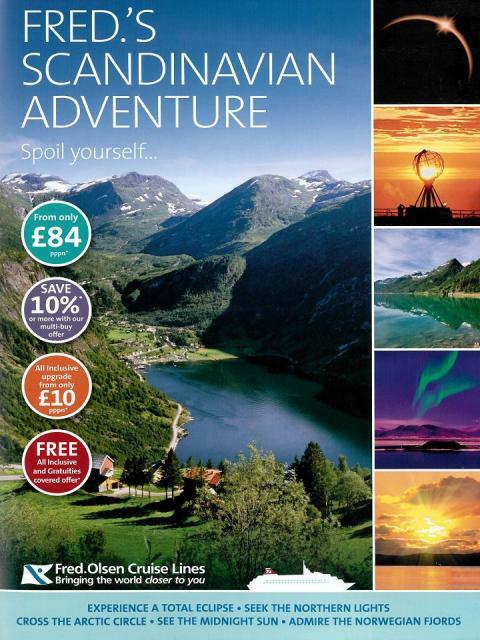 The new ‘Fred.’s Scandinavian Adventure’ brochure features a selection of unique experiences, suited to cruisers with a lust for exploration; why not take in the majesty of the ‘Northern Lights’, wonder at the spectacular Norwegian Fjords, cruise the largest archipelago on the planet to Stockholm, visit the only ABBA museum in the world, or have fun at St. Petersburg’s ‘White Nights Festival’? If guests book one of these exciting cruises by 2nd March 2015, they can make the most of Fred. Olsen’s cruise sale, which offers a 10% discount off the price of the cruise, plus they can save even more if they book more than one cruise at the same time – up to 30% off*. In addition, guests can upgrade to the ‘all-inclusive’ drinks package for just £10 per person, per night* on all sailings featured in the new brochure. - Boudicca’s 13-night D1513 ‘White Nights & Cultural Sights’ cruise, ex Rosyth (Edinburgh) on 8th June 2015. Prices start from £1,349 per person. Boudicca cruises first to Copenhagen, in Denmark, where guests can explore the beautiful, historic setting of Christiansborg Palace, the colourful pavement cafés of Strøget, the fun-filled Tivoli Gardens, or take in the sights and sounds of pretty Nyhavn, with its buzzing quayside restaurants and bars. Next stop is Tallinn, in Estonia. Made up of medieval town walls, cobbled streets, picturesque churches and towers and an enchanting UNESCO-listed Old Town, the Estonian capital provides a beautiful fairy-tale setting. Guests will then enjoy an overnight stay in Russia’s St. Petersburg, the ‘Gem of the Baltic’. Here, guests can discover the city’s many highlights, including the Hermitage Museum, Peterhof Palace and the main street, Nevsky Prospekt. There is also the chance to spend an evening at the ballet. Boudicca then stops in Stockholm in Sweden, which is set on 14 islands, at the foot of the second largest archipelago in the Baltic. Guests can amble through ‘Gamla Stan’ – the Old Town – or head to the Vasa Museum and the Royal Palace. Visby in Gotland, Sweden, is Boudicca’s next stop. A living museum of narrow, cobbled streets and ruined churches, the town nestles behind 13th Century city walls, where much of the medieval atmosphere has been preserved; it is now a UNESCO World Heritage Site. Breathtaking scenes will greet guests, as Boudicca cruises along the beautiful Oslofjord, en route to Norway’s capital, Oslo. Highlights include the medieval Akershus Castle, the unusual Vigeland Sculpture Park, the fabulous Viking Ship Museum and the National Gallery, home to Edvard Munch’s The Scream. - Braemar’s 12-night M1518 ‘Summer Solstice & Midnight Sun’ cruise, ex Dover on 16th June 2015. Prices start from £1,169 per person. This cruise will begin with a full day of scenic cruising, as Braemar passes Lysefjord, Preikestolen – also known as 'Pulpit Rock' – and Mount Kjerag – 'Mountain Bolt'. In many parts of this stunning fjord, the water is as deep as the surrounding mountains are high. Braemar will also cruise Karmsundet, a narrow channel between Karmoey Island and Haugesund, which is only passable by smaller ships. Guests will then have time to explore Kristiansund, home to Norway's scenic and world-renowned ‘Atlantic Road’. Braemar then crosses the Arctic Circle and cruises the ‘Black Glacier’, before arriving in Tromsø, in Norway. This town is known as the ‘Gateway to the Arctic’ and boasts beautiful coastal views from Mount Storsteinen. Guests can reach the top by cable car and will be in one of the best places to see the ‘Aurora Borealis’, or ‘Northern Lights’. Guests can also take a tour to the Tromsø ‘Wilderness Centre’, where there is an opportunity to partake in a thrilling dog sled ride! Next stop isHonningsvåg, in Norway’s North Cape. Here, guests can take a tour to the North Cape Plateau – Europe’s northernmost point – where the views of the rugged mountains and Arctic Ocean are stunning. Braemar will then spend two full days cruising the Arctic, taking in the impressive surroundings of the North Cape, the Seven Sisters Mountain Range, Torghatten – the mountain known for having a hole straight through the centre of it – and the island village of Rørvik. Guests will then arrive in Molde, in Norway; the town of roses and jazz. See the statue of the ‘Little Rose Seller’, visit the Romsdal Outdoor Museum and Molde Church, or take a tour on the Rauma Railway, passing through breathtaking scenery, before reaching the fabled ‘Troll Mountains’. The final destination on this cruise is Bergen. This beautiful city is framed by seven magnificent hills, the highest of which can be reached by funicular railway, from where guests can enjoy views of the historical Hanseatic buildings. Prices listed for these cruises are per person, based on two adults sharing a twin-bedded, Inside cabin,and include accommodation, all meals and entertainment on board, and port dues. Fred. 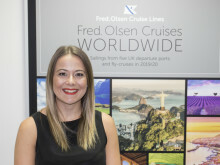 Olsen was delighted to be named one of the Top 3 UK cruise lines and awarded a prestigious ‘Recommended Provider’ accolade, in Which?’s first-ever dedicated cruise survey in 2014. Experts at influential consumer website Cruise Critic have also voted Fred. Olsen ‘Best Value for Money’ in its ‘Cruise Critic UK Editors’ Picks Awards 2014’,for the third consecutive year. *See the website www.fredolsencruises.com for full Terms and Conditions.